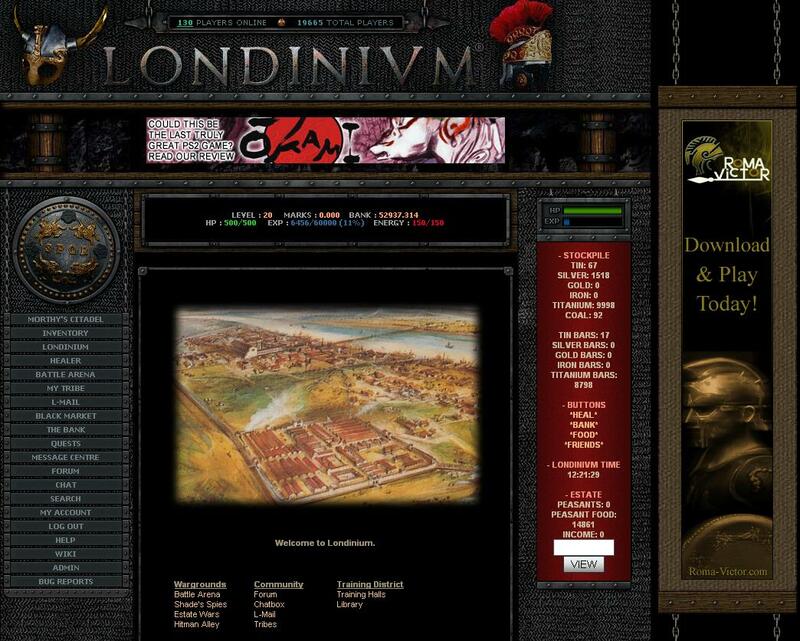 Londinivm is a browser based MMORPG set in ancient Roman ruled London. 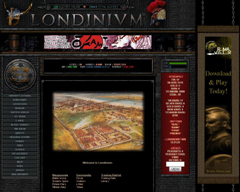 Londinivm is totally free, and can be played on any web browser, with no downloads. 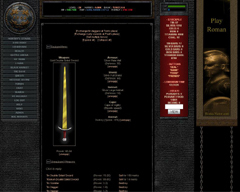 Londinivm offers eight different player classes, each with unique assets. Choose one and be on your way! The Greeks were the first to divide the world into the Civilized World and the Barbarian World. The Romans adopted this concept, viewing the lands and people outside Roman rule as barbaric, or savage. In truth, barbarian civilizations often had rich cultures of their own. As Rome expanded its rule, many barbarians refused to give up their freedom and began to fight against Roman invaders. The Barbarian receives a 10% bonus on his Strength score. The people's need to be entertained was well-known among Roman politicians, who held lavish festivals and celebrations dedicated to the gods or to their military victories. Many professions came along which made good use of this. The Bard was an individual skilled in the lore of music, as well as that of storytelling, fascinating the crowd that gathered to watch him perform. The Bard is one of only two classes, along with the Rogue, to have the "thieve from hand" skill. Religion has always been an important part of any civilization. In ancient times, polytheism, or the faith in several gods, was widely spread across the world. Different cultures worshipped different deities, although the Romans always sought to prove to the nations they conquered that native gods can also be found in Roman mythology as Roman gods. Every god had a specific rite, and the duty to perform these rites fell on the shoulders of priests. As messengers of the gods, priests held tremendous power, as they could predict the future and present to both commoners and nobles, empowered by the god they served. The Cleric is able to wield two weapons at once. This comes at a cost, however, as the Cleric cannot equip a shield or a helmet. Fighters have always held an important place in society. Whether defenders of the community, or skilled attackers of neighbouring settlements, fighters would train to master their weapons and gain the edge over their opponents. Rome had a permanent army organized into legions. The legionnaires were the elite soldiers of their times, relying on superior weapons and excellent tactics. The common Roman soldier was skilled in the use of the short sword, and relied for protection on armor for the torso along with a tower shield. They were hardened by intense training and could march at a fast pace across the Empire. A Roman border province had at least several legions to defend it against Barbarian raids. The Fighter receives a 10% bonus on his Speed score. Before the invention of coinage, trade would be carried out by exchanging one type of good for another. Merchants came along to carry out transactions between different regions, often embarking on long journeys to deliver goods. After currency came into use, Merchants would not only deal in the transport of goods, but would also exchange coins from one region to those from another along their voyages. This made them efficient money-makers, though they often invested their accumulated wealth on bigger convoys and new trade deals. The Merchant receives increased interest at the bank: 1.5% compared to the usual 1.25%. He is also able to work at the Employment sector in Londinivm while owning an estate. Monks spend their lives in the pursuit of enlightenment. Through meditation, they seek to achieve balance between their spirit and body, by identifying and using the energies that flow through them. Though monks usually have a faith which they promote, they do not seek a religious position in society. Rather, their faith is a means to channel their spiritual energy. The Monk receives free healing. Science was cultivated at first in the ancient world. People sought to uncover as much as possible about the lands around them, and the plants and animals which can be found therein. A ranger would put this knowledge to good use when heading into the wild, either to hunt or capture animals for the arena. The Ranger receives a 5% bonus to both his Strength and his Speed scores. The Ranger is one of two classes, along with the Rogue, in which the character picture is female. Wealth has played a major role in society, and there have always been those that have tried to accumulate as much as possible. Rogues use this in their own interest, quietly stalking those that carry a heavy purse and waiting for the opportunity to steal their money for themselves. The Rogue is one of only two classes, along with the Bard, to have the "thieve from hand" skill. The Rogue is one of two classes, along with the Ranger, in which the character picture is female. Londinivm also offers a unique energy system. Everything in the game requires energy: to battle opponents in the arena, thieve from other players, mine for tin or silver, smelt ore into bars, or forge bars into weapons. Energy regenerates at a rate of 3 every 15 minutes on World One, so if you run out, just rest a moment, and you will get more! Choose to work on any of the eight available skills to make a name for yourself! Londinivm offers a diverse selection of skills, there is something for everyone. You can also train your speed, strength, knowledge, and start employment. For more information on skills and abilities click here. Londinivm offers a large collection of armour and weapons to create, trade, and fight with. You can produce weapons from raw materials. Armour is split in to three types: Body, helmet and shield. Hand to hand weapons and ranged weapons are available. 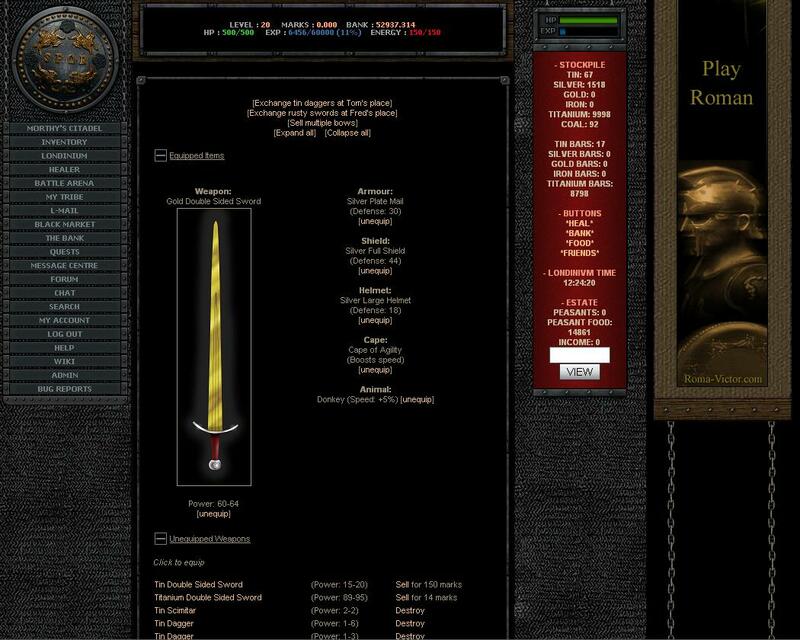 Run your own estate to earn money, while attacking and defending with troops. Make your own tribe, or join an existing tribe, to take advantage of Londinivm's huge tribal system. Experience what real war is about, in our tribal wars area.